This plate helps promote independent eating! The high rim and reverse curve on one side of this plate aids in scooping food onto a utensil without spilling over the side. The bright blue color has been shown to have positive results when used with individuals who have a poor appetite, especially those with low vision. A rubber, suction cup base attaches to the bottom of the plate to secure the plate to your table. 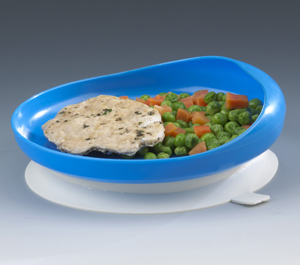 The non-slip properties of the plate aid those individuals with the use of only one hand or others needing assistance in eating. This is a small plate - 6.5 inches in diameter. The plate is upper rack dishwasher safe. The flat bottom and high rim with a reverse curve on one side helps in scooping food onto a utensil without spilling over the side. 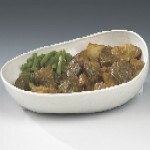 Thie dish is a 7.5" x 6" oval.